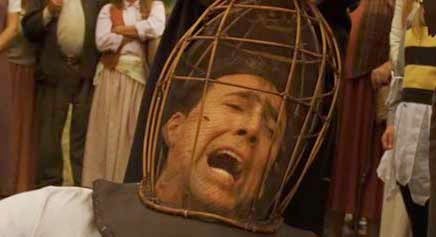 Nic Cage's character in 'The Wicker Man', Edward Malus, is clearly Johnny 'Ghost Rider' Blaze in disguise. The pseudonym Blaze has chosen is a clear clue, the word 'Malus' being Latin for 'bad' or 'evil', and as everyone knows, Ghost Rider's powers are Satanic in origin. His job in 'The Wicker Man' is that of a motorcycle cop, Blaze clearly being unable to completely give up his love of motorcycling despite being undercover. Throughout the movie, Malus acts more like Ghost Rider than a normal person. He has a strange hair-trigger nature, and is constantly punching women, reflecting Ghost Rider's own devilish motivation. He steals a bicycle at gunpoint, unable to spend any time walking on two legs when he could be riding. Whilst his head never turns into a flaming skull, careful analysis shows that he most probably does have a skull hiding under his face: the skull of Ghost Rider? The finale of the film shows Malus being captured and tortured with bees. Ghost Rider is legendarily weak to bees, as bees create honey and God promised his followers in the Bible a 'land of honey'. Drawing his powers from Hell, Ghost Rider is helpless against the onslaught of holy bees. He is not defeated however. Tellingly, the very end sees Malus imprisoned inside an impenetrable wicker cage. He is able to use his Ghost Rider powers to finally reveal himself and burst into flames, escaping his prison and about to bring fiery, chain-whipping justice to all as the credits roll. Hopefully this trilogy will not be the end of Ghost Rider. Perhaps Civil War will see the debate silence by Nic Cage wielding a flaming chain. Only time will tell!